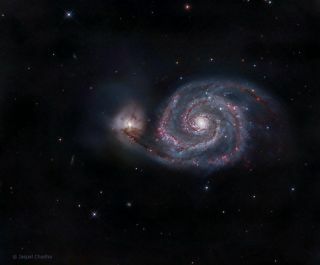 The striking arms of the Whirlpool galaxy can be seen in stunning detail in this astrophotographer image by Jaspal Chadha. The striking arms of the Whirlpool galaxy shine stunning hues in this amazing photo by an amateur astronomer. Photographer Jaspal Chadha captured this image from London using a Altair Astro RC 250TT Scope, a QSI 690 CCD and Ioptron CEM60 Mount. The loosely-shaped arms of the galaxy are star-formation factories. In Messier 51, stars are first birthed within dark clouds of gas on the inner edge, moving to bright pink regions, and ends with blue star clusters along the outer edge. The galaxy is also famous because Lord Rosse first observed the spiral structure in 1845 using the legendary 72-inch telescope at Birr Castle in Ireland.